EXPLORE THE 6TH GRADE CURRICULUM. Reading, writing, listening, and speaking are encompassed in English Studies for Wood Acres sixth graders. Instruction in these areas occur both within each discipline and as well as via cross-disciplinary programming, linking these essential English skills to application within other academic areas. Sixth graders reap the benefits of expertly taught literature with full implementation of the Socratic method of discussion. Outside reading both assigned and by choice is not only encouraged, but also an important part of Wood Acres sixth grade reading journey. Periodic review on advanced word attack and higher order comprehension skills is woven into texts. Reading for sixth graders must be both solitary and interactive with peers for these students to understand that reading is an excellent form of communication as well as a much desired life choice for adults. Further work on communication skills comes from emphasis on the writing process, both creative and didactic. A growing knowledge of English grammar rules and how to apply them to one’s writing blends well with advanced technology work completed with laptops in class. Vocabulary and etymology assignments are linked carefully to specific vocabularies of each discipline studied. Work on public speaking and later debating skills helps students in the Upper School gain the needed confidence to address a wide audience effectively. Wood Acres sixth graders communicate online, in person, in writing, and with the best protocol around. Sixth grade math students are immersed from day one into an algebraic thought process that focuses on all skills and operations with rational numbers. The rigorous curriculum lays the ground work for the basic understanding and discovery of algebraic and geometric concepts. Students begin with integers and reinforce them throughout the year with one and two step algebraic equations and inequalities with decimals, fractions, and integers. Through this algebraic immersion, sixth graders develop a deeper understanding of rational numbers that will prepare them for future success in higher level math. Other topics studied include ratio and proportion, percent and consumer applications, data analysis, statistics and coordinate geometry. Problem solving, mental math, journal writing, and critical thinking overlay student- teacher math discussions. Students are taught math strategy and logic especially in relation to problem solving. Cross-curricular applications of mathematics to science, art, technology and music help build strong curriculum links for a sixth grader and his or her learning. More commonly referred to as Social Studies, Wood Acres considers each component important enough for academic consideration on its own merits. Based on the National Geography Standards established by The National Council for Geographic Education, student knowledge of where we are in time and space is a vital life skill in an ever-shrinking global community. Geographic skills are covered directly and focus on the Western Hemisphere in sixth grade. Further student learning is focused on history, economics, culture, ethics and belief systems as well as social and political systems. Civic understanding is fostered through studies of national identity, Constitutional heritage, current events, and citizenship. Each area of study is enhanced with study skills, visual learning, map and globe work, and class participation. Vocabulary development is vital to the conversation of the social sciences as well as student work in research with primary sources, artifacts, and retrospective analysis of historical events. Ancient Mesopotamia, Ancient Egypt and Nubia, Judaism, Early India and its Empires, Ancient China and its Empires, Ancient Greece, Ancient Rome, Byzantine Empire, Islam Civilization, and Early Africa come alive in sixth graders’ study. Students are continuously challenged to answer essential questions and focus on the “whys” of history as opposed to simply memorizing dates and events. Sixth graders embrace a global perspective, engage in on-going historical dialogue, and take away a deep understanding of our world history. The Wood Acres School’s groundbreaking spiral science curriculum literally leaps from the mind-numbing “read the chapter and answer the questions” approach to a hands-on, experiential laboratory setting that has sixth graders truly learning and living the scientific process. An in-depth study of changes and reactions, concentration, cycles, energy, force and motion, force and pressure, properties of matter, structure and function, and systems are areas of focus. Experiencing this type of curriculum demanded a state-of-the-art laboratory that truly allows each student to practice and experiment with the scientific process at all times. This type of science instruction also stretches student patience with trial and error, fosters both individual and partner work, and takes creative “out-of-the-box” thinking to a new level. 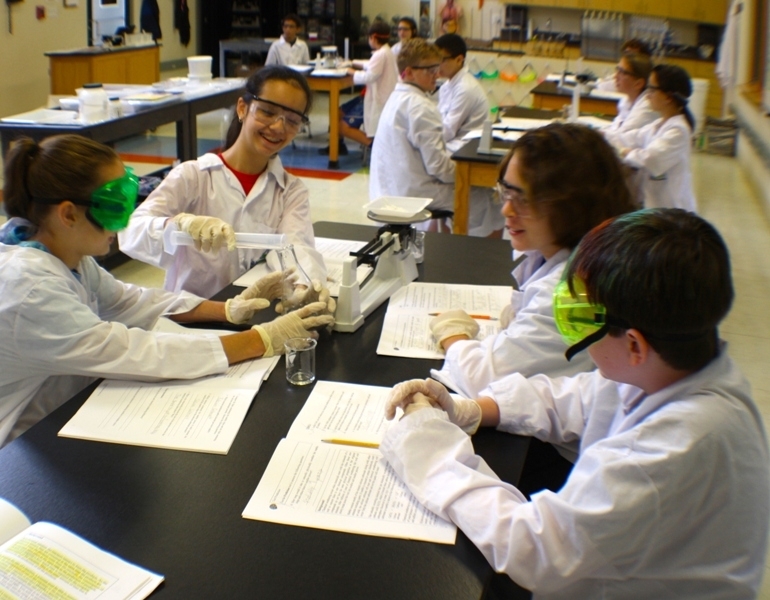 The science-math connection is strong throughout the program and provides sixth graders with the tools to become independent researchers with problem- based projects. Students apply their learning with an outstanding class trip to Marine Lab each year. The trip is a wonderful adventure as students bring their learning outside Key Largo, FL and complete labs both on the boat and in the water. With Wood Acres’ Spanish program beginning with three-year-olds, the student of Spanish in sixth grade is quite advanced. Instructional methodology includes TPR, total pupil response, which encourages students to become comfortable in speaking, listening, writing, and reading Spanish. Bilingual selections in the library assist students in leisure reading in a second language as well. Students in sixth grade are also exposed to the works of some of Spain’s best authors and artists and learn much about Spanish culture and its influence on American culture. With Wood Acres’ designation as an International Spanish Academy (ISA) through the Consulate in Washington, DC and Spain, Wood Acres students will have the unprecedented opportunity to excel in this language and receive advanced placement in any area high school, ISA high school program if applicable, international school, or private high school. Sixth graders are more than ready to forego the traditional playground activities for a “hipper” and more age-appropriate program. Students enjoy a wide range of experiences that include programs focused on individual strength, agility and stress-reduction. Curriculum includes fitness, Zumba, Body Jump, agility, strength building, aerobics, fencing, and team sports. Mental and physical fitness, sportsmanship, and school spirit all find a place in our PE program for sixth graders. Taught by an accomplished artist in her own right, the Wood Acres art program for sixth graders is a natural continuation of the rich curriculum of the Grammar School. With an ever-refined eye for line, form and perspective sixth graders blend didactic instruction with creative, edgy and captivating art projects. Students display their pieces at an annual Fine Arts Show each spring. Students are trained to look at the world through the eyes of an artist, seeing lines of symmetry, perspective, geometry, color, balance, shading, tone, and depth as the art of nature and man’s creation. Art is a very natural and very important outlet for the unique developmental stages of a young adult. Blending classic music instruction with a strong youth appeal, the Wood Acres band, helps create students who become educated audiences as well as engaged performers. All fifth and sixth graders participate in band and play an instrument of their choice. Students read music, perform in concerts, and learn about the culture surrounding the music they study. Band concerts give students ample opportunities to prepare and perform in front of live audiences under the direction of a talented musician in his own right. The Wood Acres School is one of only a few private schools to offer band during the school day and as part of the student tuition (students rent or purchase instruments). This class meets weekly to discuss topics relevant to achieving student’s fullest potential and greatest academic success. Students are challenged to self-reflect, set and examine academic goals, evaluate and modify study skills, assess strengths and areas for improvement, and maximize their academic assets for their own benefit and in service to others. As service learning is an important tenant of a complete education, students also use Learning 101 class time to plan and work on numerous service projects throughout the year. Taught by both the Wood Acres School Counselor makes these classes impactful. Note: While academic study is the core of The Wood Acres Upper School, we also realize the daily need for students to “chill”, relax, and catch their breath to continue the academic day. Work on proper and acceptable socialization is key to helping our Upper School students be well educated, resilient, well rounded, and fun to be around. The sixth, seventh, and eighth grade years can be challenging, but they also can reap the greatest rewards if the entire school community is focused and committed to student growth and achievement.